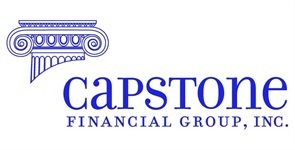 Why Your Accounts Are Safe At Capstone Financial Group, Inc. Your assets are held in custody with National Financial, a subsidiary of Fidelity Investments. This approach allows the best of both worlds. Capstone will help you with customized financial advice and personalized investment decision making. For your protection, your investments are held separately by a leading, well respected, national Firm (Fidelity) that specializes in helping independent financial advisors and institutions with their custody, transaction processing and reporting needs. We were very selective in choosing the location of your “lockbox”. You need a company that is safe, provides extremely high quality services, and is cost effective, so we can help keep your costs down. We chose Fidelity Investments because we believe they are accurate, experienced, stable, profitable, large, well established, and have the same dedication to our clients as we have. They also have enough scale to be cost effective. Fidelity is audited by a leading independent accounting firm, -and is among the most financially strong companies in the Financial Services industry. But it is not enough, by itself, to have your assets in the custody of and processed by a strong, stable, focused company like Fidelity. That is why there are many additional layers of safety for you: Your assets are YOUR assets and no one else’s—they are strictly separated from the proprietary assets of both Fidelity and Capstone Financial Group, Inc. Your assets are protected by strict compliance with regulations established by the U.S. Securities and Exchange Commission (SEC). The Securities Investor Protection Corporation (SIPC) provides theft protection for your accounts, and Lloyd’s of London provides additional theft protection. Reporting is strength at Fidelity Investments. As with other top-end custodians, you will have a choice of paper account statements or electronic statements. You can easily track your progress over time. End-of-year summary statements collect all of your important information, including purchases, sales, cost basis, and income and dividend distributions, in a single report to simplify your tax reporting. In addition, you can choose to have truly consolidated statements with the ability to view all your accounts for which you have internet access. Securities in accounts carried by National Financial Services LLC (NFS), a Fidelity Investments company, are protected in accordance with the Securities Investor Protection Corporation (SIPC) up to $500,000 (including cash claims limited to $250,000). Fidelity has arranged for additional protection for cash and covered securities to supplement its SIPC coverage. This additional protection covers total account net equity in excess of the $500,000/$250,000 coverage provided by SIPC. Neither coverage protects against a decline in the market value of securities. Fidelity Brokerage Services LLC (FBS) through National Financial Services LLC (NFS) added Lloyds of London as a provider of excess Securities Investor Protection Corporation (SIPC) coverage (excess SIPC coverage) for its customers. The additional protection from Lloyds of London covers up to an aggregate limit of $1 billion. There is no per account dollar limit on coverage of securities, but there is a per account limit of $1.9 million on coverage of cash awaiting investment. This protection represents the highest level of excess SIPC coverage currently available. The excess protection from Lloyds of London, which has received an A rating from rating firm AM Best, becomes available in the event that SIPC limits are exhausted.